We have partnered with alarm.com to bring the leading home security and automation app for your home. For instructions on how to download app click here. Trusted – Alarm.com is trusted by over 2 million people to protect their homes and businesses. 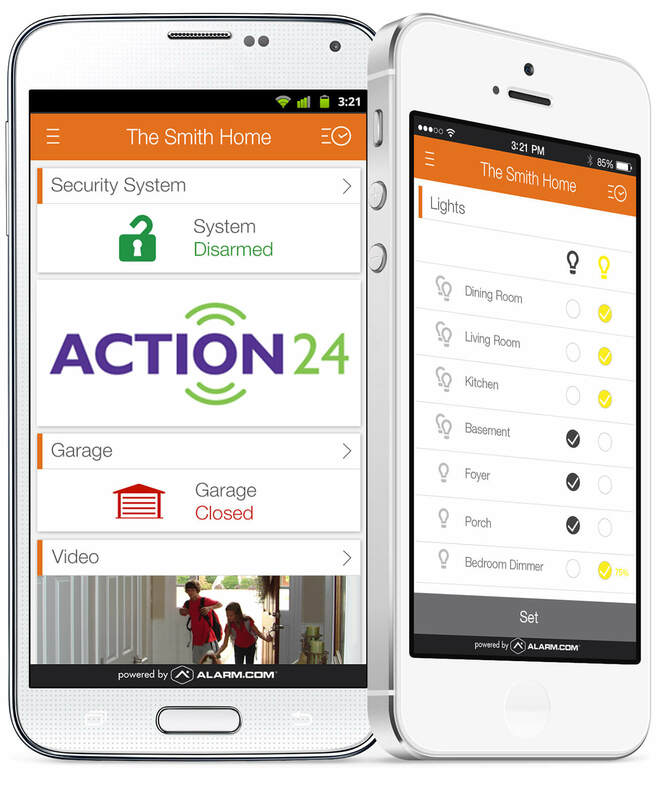 Integrated – The alarm.com app that controls your Action24™ system seamlessly connects the key devices in your home on one platform so they work together and work smarter. Compatible – With all smartphones and tablets. Notifications – Receive real-time alerts via text, push notification, email or phone call. Easy access – Remotely set and unset your alarm. Always aware – Receive notifications direct to your phone when literally any type of alarm event occurs in your home. Forget to set your alarm? – Set up geofencing to remind you to set when you move a certain distance away from your home. Keep track – Set up multiple user codes. Lights – Control lights/radio/electronic devices (all from your home security app). CCTV – View live CCTV footage from your home along with up to 1,000 saved clips on your Action24 smartphone app.